Stores reference 22c/80. Size 7/8. 1939 contract date. The leather is in good to very good overall condition bar light scuffing and surface marks. Good straps and buckles. Original leather soles and heelplates - both worn but in sound condition. 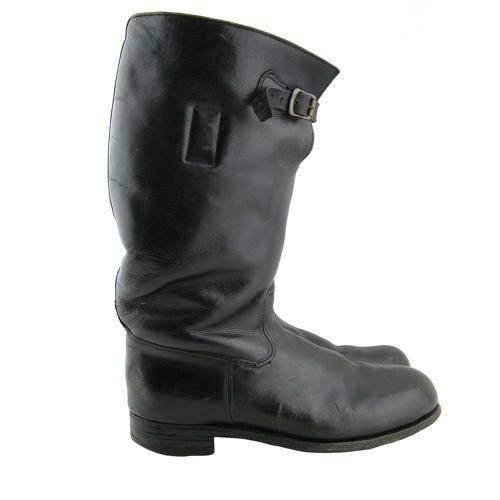 Some loss of fur at the top edges of the boots, notably the left, with further loss around the ankles and other relatively small areas. Insoles absent. The puller tags in both boots have clear Air Ministry King's Crown markings, 1939 date code and A.I.D marks. Please note that this is a mis-matched pair in terms of size, one being a '7', the other an '8'. However, the size differential is not particularly obvious and these have clearly been worn as a pair having the same sole/heel wear etc. The issue of mis-matched sizes is not uncommon. A good used pair of these rare early boots. Excellent display item. Stock code B18966.